Although national and international events risk making all my personal events seem insignificant or obsolete, I wanted to write up some of the events of the previous week before they escape my memory. 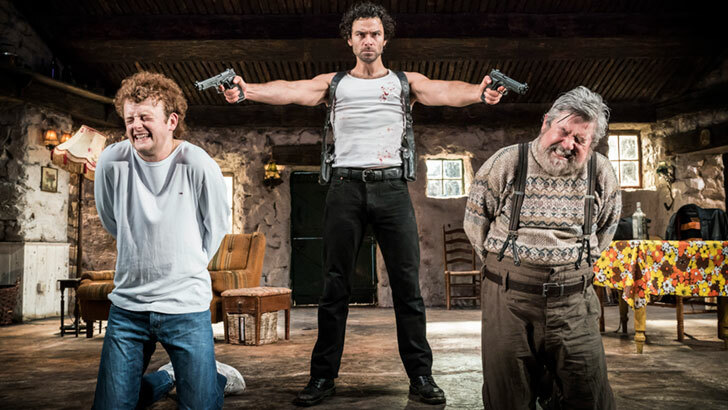 On Friday I went to see The Lieutenant of Inishmore, a dark comedy by Martin McDonagh (writerwith plays such as The Cripple of Inishmaan and The Beauty Queen of Leenane, as well as the film Three Billboards Outside Ebbing, Missouri to his credit). I have to admit I went mostly for Aidan Turner, who is pretty much exactly my type of romantic male interest, but it turned out to be much more than just a showcase for him and his pecs. This is a play designed for a strong ensemble cast, and it certainly had it, including a young RADA graduate Chris Walley, who was by turns a grumpy teenager, intimidated, sensitive, very proud of his long hair, but also terribly dim and therefore hilarious. On paper, the story seems grim. Northern Ireland in 1993. Mad Padraic is deemed too brutal for the IRA, but he is getting impatient with the splinter group he’s in and thinking of starting his own splinter group. He has some torturing business to resolve and leaves his beloved cat Wee Thomas in the care of his father. The cat dies and his family and friends back home try to cover the fact, for fear of what he might do… And he does! This is a bitingly funny satire about twisted ideals and violence, sentimentality coexisting with ferocious brutality. Written in 1993, when this was still anything but funny, its black Irish humour was only appreciated in 2001, when it was first performed. Highly recommended, if you can get tickets! Also, a good chance to hear Aidan Turner speak with an Irish accent rather than a fake Cornish one. Image from Delfont Mackintosh Theatres. The White Horse, from Oxford Mail. It was also a great opportunity to catch up with my friend, who has sold her house and lives in a camper van, driving around the country and doing whatever takes her fancy. She had just spent a week in Snowdonia, another in Dorset and was off to the Latitude Festival. A part of me was slightly envious, and another part terrified of this kind of lifestyle, which takes nomadic to the most extreme! Upcoming events include watching some Wimbledon, some World Cup, and celebrating 14th July with Tartuffe in London. But if you are in London and free on Wednesday 11th, you should go to the Hayward Gallery at the Southbank, which will be celebrating its 50th birthday with entry fees of only 50p that day. P.S. Late entry – my friend took a picture of me chalking like someone who loves crime fiction! I feel sorry for Aidan Turner who will on,y be thought of by so many people as the guy with the pecs when he is clearly a very good actor. I know, it is sad. But like Peter O’Toole or Paul Newman or Helen Mirren, he will grow older and become more venerable and appreciated for acting qualities more than for being pleasing on the eye. Never underestimate those personal events. They are the lubricant, the lifesaver in the chaos that is our world. They are to me, that’s for sure! But perhaps not everybody else might be interested in them. 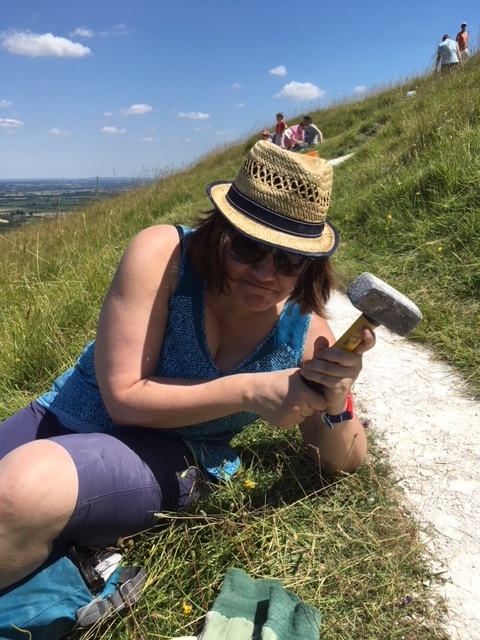 Thank you and your fellow volunteers so much for your work on the Uffington White Horse. It’s my favourite of the white horses. I look out for it whenever I take the train to London and was saddened by its disappearance but had noticed it was slowly reappearing. Ah, I didn’t realise that the improvement was visible! Thanks so much for that! The problem is the grass is always ready to grow back on it as well. I saw it two weeks ago on my way back from holiday and it was much clearer than it had been the previous month. A constant battle, but it’s beautiful. Now, that’s interesting, Marina Sofia – chalking. I hadn’t heard of it, but sounds like a good way to do something different, do some good, and get some exercise, too. Glad you enjoyed the play, too. Absolutely! I feel totally Zen now! 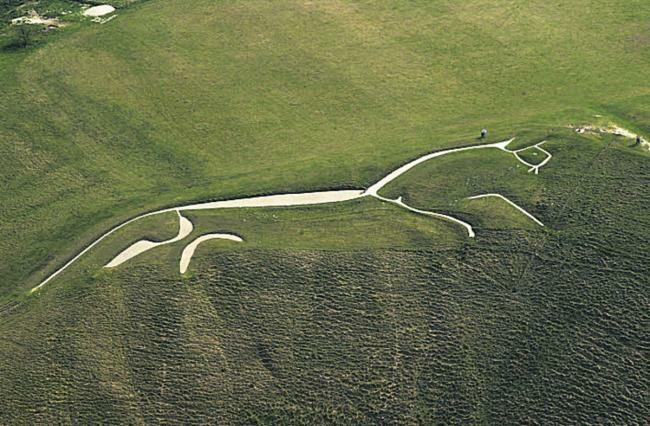 Chalking The White Horse is such a brilliant thing to do! It’s a beauty too. I am beyond envious: of the chalking, of seeing Aiden Turner and of your friend for taking to the roads. Just what I needed to balance the scales against the political shenanigans….